Installing the moulding – Doh! I used the following section from Chris Schwarz Six Board Chest Chapter to help me install the moulding around the chest. His process worked great, but my lack of fore sight resulted in less than fabulous results. 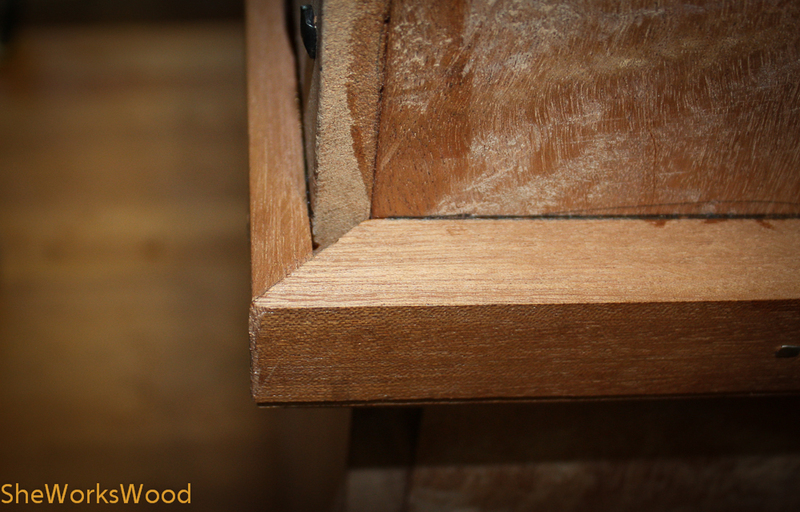 Wrapping moulding around three sides of a carcase is cake compared to making the full 360°. Focus on getting one corner good and tight. 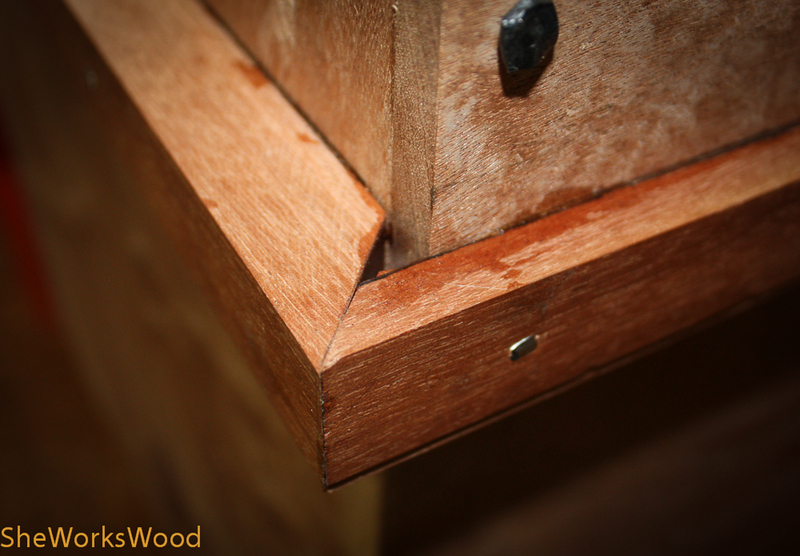 Then clamp those two pieces in place on the chest and mark the other corner for its miter. With both miters cut on the front piece you can focus on getting the fit tight on the returns (the pieces that “return” down the ends of your chest). I leave the returns long until after everything is glued and nailed in place, so don’t mess with those until you have to. Planting moulding is an art. There are lots of ways to do it; I learned how to do it from a trim carpenter. 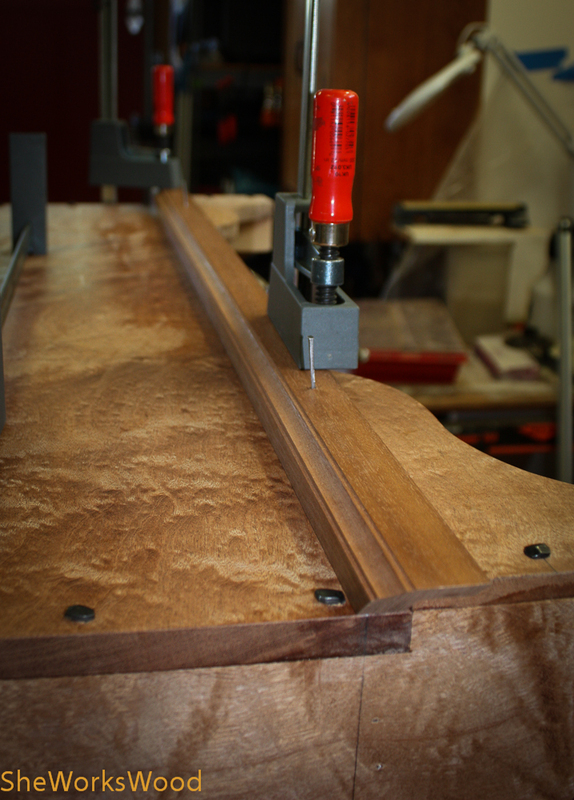 I drill pilots for my fine finish nails through the moulding and push them into the pilots with my fingers until the tips of the nails protrude slightly (almost nothing) from the moulding. Drilled pilot hols with nail inserted. 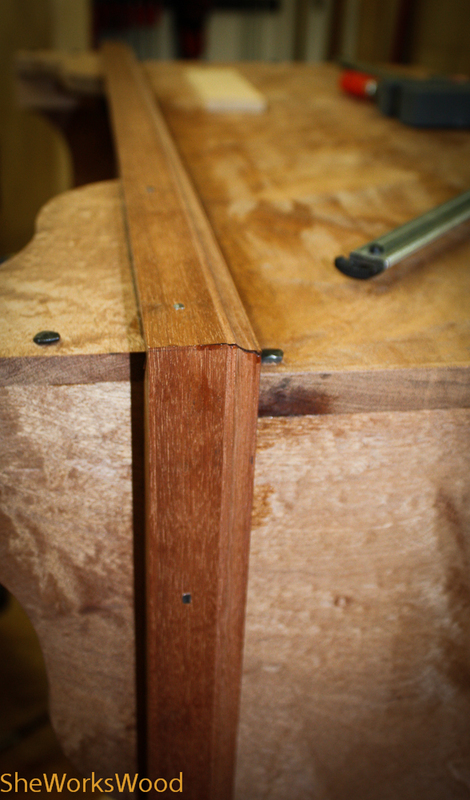 I fit the miters on the carcase and then tap the nails into the carcase so they bite the carcase. Then I remove the moulding and add glue to the moulding. Glue the entire front of the moulding. 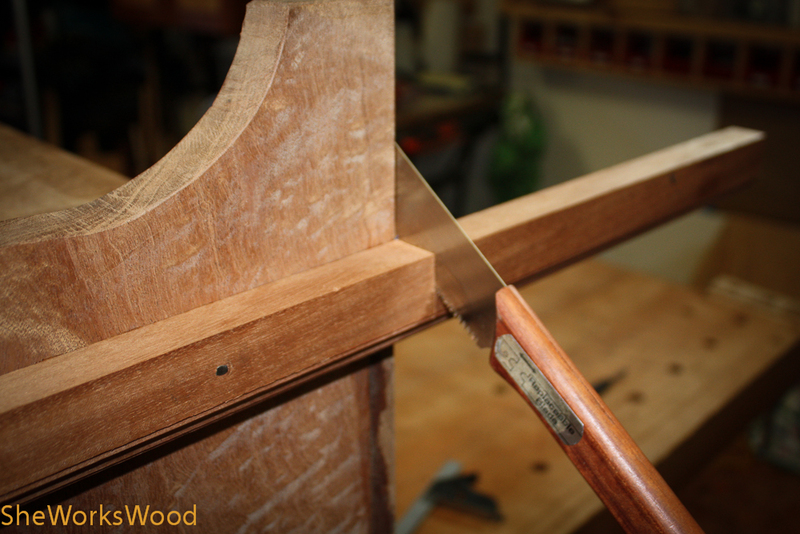 On the returns, only glue the miters and the front one-third of the moulding to the ends. Moulding glued and nail driven in. Press everything in place for a minute or two. Then drive the brads. The moulding should not shift. Set the brads. Then saw the returns flush at the back of the carcase. The base is complete. So why didn’t my mitres close up? I didn’t get my case exactly square and once the nails were in, I was’t able to fix it. Doh! Underside of moulding nice and tight. This entry was posted in glue up, moulding, six board chest and tagged moulding, six board chest. Bookmark the permalink. 3 Responses to Installing the moulding – Doh! I have a saying when this happens to me ” all experience is good, some is more pleasant than others”. I certainly empathize with your frustration. 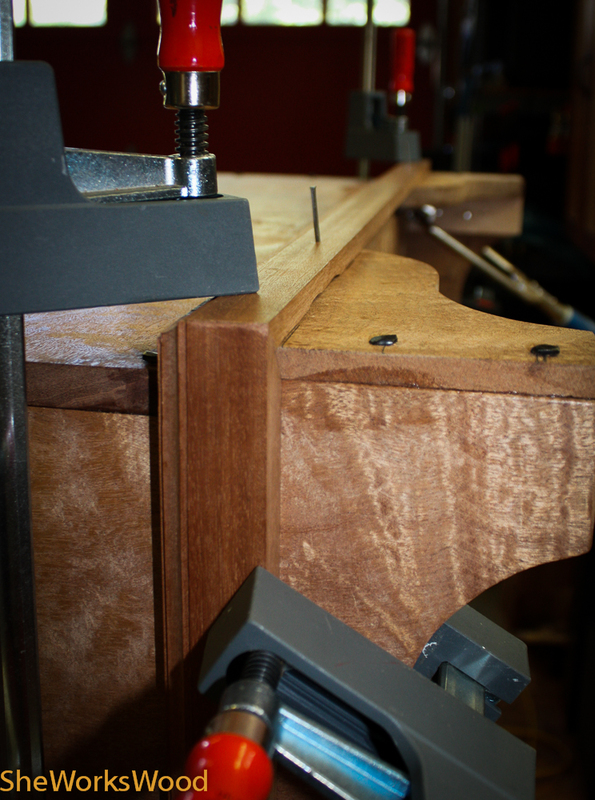 When I made the tool chest I clamped and glued the dovetailed trim crooked, and ended up planing it off and doing it again. That was great experience one I hope not to repeat. “A great experience, one I hope not to repeat.” I love that, and have more than my share of them. I think the chest looks great. 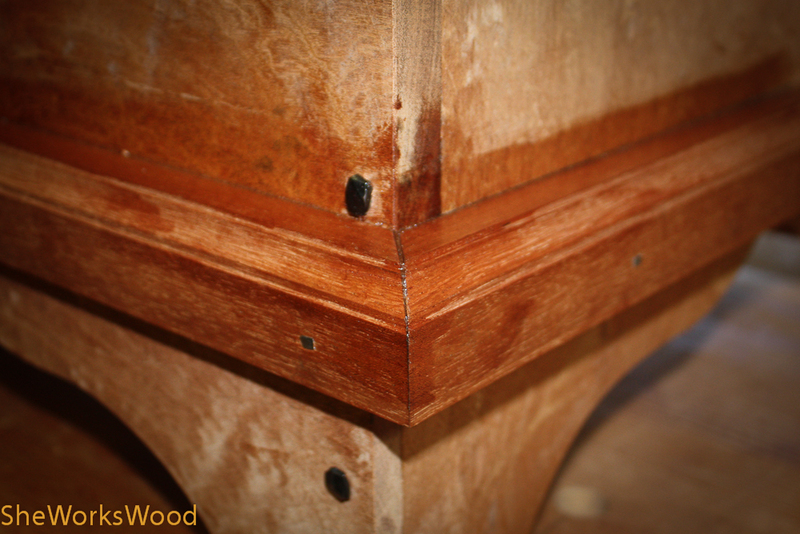 Stand four or five feet back, and imagine the chest with finish on it. Will it be noticeable and bother you? If so, take it off and re-do it (looks like you were thinking ahead and used hide glue); You’ll have the benefit of another great experience! I hate making mistakes, and I hate fixing them, it’s a toss-up.